When buying a best soft-sided cooler for your next adventure getting away from it all whether a road trip or a camping tent trip, you want to consider certain features. Are they affordable, versatile, have brand reputation, and weight and portability. You might simply want a cooler that is not too heavy for your lunches or taking to sporting events. You need to decide if you want a shoulder strap and handles or just one or the other. Soft-sided coolers are available in many sizes and some have wheels for easy movability. If you have a hard case cooler, you might want only a soft cooler for drinks and food. These will not cause condensation on your vehicle carpeting because they are made of fabric materials. These are more odor resistant. 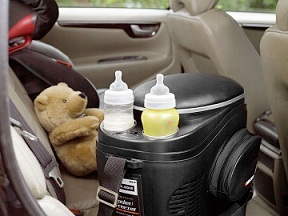 There are many compartments to hold cups, snacks, and other necessary items you take with you. 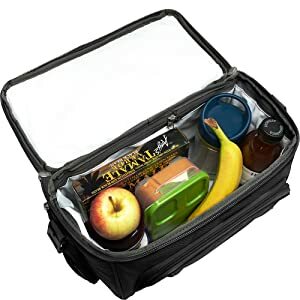 Some have zippered compartments for safe-keeping your keys, sunscreen, or cell phone that you do not want to get wet or carry in your pockets. Many are versatile so that you can keep ice frozen for many hours with the heat of the day. They keep cold food cold and hot food warm for many hours. They can be used anywhere making them versatile for the beach or at a park picnic with the family. 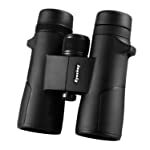 By being adaptable and multipurpose, they are handy and useful all year long. A reputable brand will offer a Warranty and provide excellent customer service when you have questions or concerns about your product or a product you are considering for purchase. The YETI® Hopper™ Two is the further development of the company’s first soft cooler, the Original Hopper™. The innovative new design not only maintains the original cooler’s portability, being totally leakproof with its DryHide™ shell, being strong, sturdy, with great ice retention, and hard-wearing, it now has more cold-holding abilities. It loads and unloads easier, and is more comfortable to tow around with its tapered body shape. All of these new features gives you an even better outdoor experience. Hopper™ Two 30 with its wider opening area is 100% leak proof as it always was. The best-selling cooler on Amazon.com® in sports and outdoors, is a high-end cooler sure to please for about $200. 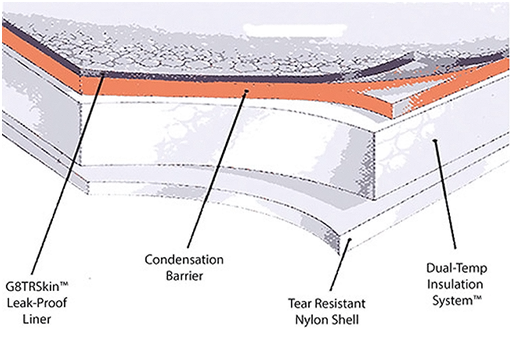 The DryHide™ shell is made of a thick and dense compact food grade fabric resisting mildew, mold, ultraviolet (UV) rays from the sun, ruptures, piercing, perforations, tears, holes, and punctures. The material is made of thermoplastic urethane ethylene vinyl acetate (EVA) and is FDA approved for food. The earthy field tan color outside contrasting with its blaze orange interior gives contrast and a handsome appearance. If you don’t want those colors, choose fog gray with a Tahoe blue interior in 20-, 30-, and 40-pound ice capacity. The cooler uses Coldcell™ insulation that is a closed cell rather than open cell rubber foam making this cooler far greater in its ice and cold maintaining ability compared to common place soft coolers in the marketplace. 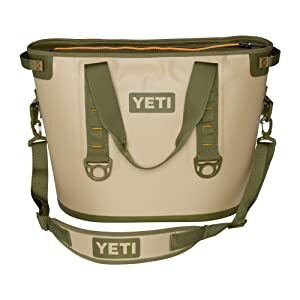 The 2 double-stitched carrying handles and shoulder strap with adjustable buckles makes this soft sided cooler easy to carry when your hands might be full of other items including your hunting guns or fishing poles. 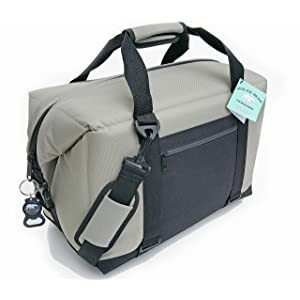 It will serve you well on day hikes, camping trips, fishing, and sporting events when you want something smaller that a large hard sided ice chest. The shoulder strap is removable and the top closes with a strong HydroLok™ zipper designed using the HazMat suit scheme. With its Six D-ring tie-down points, you will have many ways to secure the Hopper™. The HitchPoint™ Grid attaches easily for anything you want to attach to your Hopper™, such as bottle or can openers, carabiners, or accessories like the YETI® SideKick™ Gear Case (sold separately). Check out the dimensions, number of cans and pounds of ice it will hold. It weighs 5-pounds empty. Precool it in the fridge overnight for the cold cans on the bottom, sandwiches, and snacks on top. The cooler cannot be folded up. You can take it on an airplane empty of food and drinks. You will want to check with your airline to see if those dimensions are allowed as a carry-on bag. You should have no problems with the zipper on sandy beaches. The fabric does not condensate getting your vehicle rugs wet; it stays dry, unless you walk in the rain or drop it in the water. Gift-wrapping is available for a gift to your family or to those you want on a hike with you. 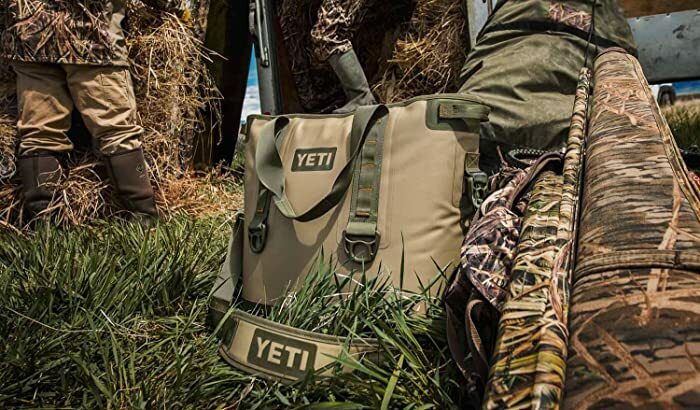 The YETI® comes with an Owner’s Manual and a 5-year Limited Warranty. It is designed in Texas, USA and made in China. YETI® Hopper™ Two 30 – Tarpon Fishing Essentials video. 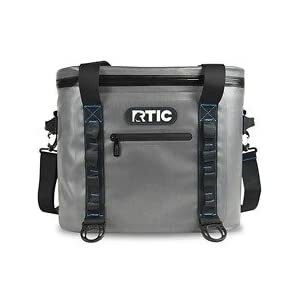 The RTIC® (arctic) is one of the best soft coolers in the marketplace being mid-size with many purposes for your adventuresome outdoor essentials. It is a best-selling unit on Amazon.com® in sports outdoor recreation camping and hiking at an affordable price under $200 for all it does to keep your ice frozen for up to 5 days. You won’t have to worry about this 100% leakproof cooler seeping, dripping, or oozing ice water. It will hold up to 30 cans, plus 30-pounds of ice, with snacks and sandwiches on top of the cans to not smash or get mushy. Being 13-1/2-inches tall, you can fit wine bottles in here upright or on their sides. The outer shell is encased with vinyl to be heavy duty for what you bought this for. It is puncture resistant, super strong, and durable, also being UV (ultraviolet) protected from the rays of the bright sunshine and will not fade. Another cool thing is it’s insulated with 2-inches of closed cell foam that will keep everything glacial cold like the Arctic. The interior pocket is great for dry items, snacks, a cell phone, car keys, wallet, or whatever. The inside dimensions are 9-1/2-inches tall x 3-inches wide x 9-inches deep. 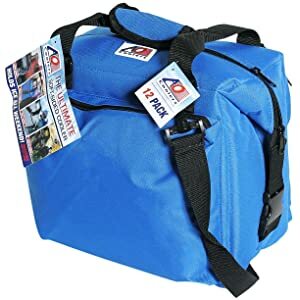 Use this fabulous cooler fishing, boating, canoeing, rafting, tailgating, at sporting functions, hunting, golfing, or a local picnic at the park. The cooler comes in a dark gray with dark blue interior. It is also available in camo color for a little more in price. The new 2017 model top unzips to lay backwards, the shoulder strap can be removed with 2 additional carrying handles for the way you like to carry it best. It will not fold up, squish or collapse. It is what it is. The rings and loops on the front are for clipping carabiner fasteners or to keep your accessories nearby like a flashlight, bottle opener, survival tools, and more. It also comes with a zipper lubricant. The zipper is made of metal, not breakable plastic. The cooler does not sweat to keep exterior things dry. It can be taken on an airplane empty of food and drinks. The bottom loops will attach to your back pack, a smart idea. Gift-wrapping is available for you to gift your family or to those you want on a hike with you. The RTIC® comes with a User’s Manual, zipper lubricant, and a 30-day Limited Warranty against defects and 4-year total Warranty term. The cooler is designed in Texas, USA, and made in China. RTIC 30 Soft Pak Look Over and Capacity Check video. 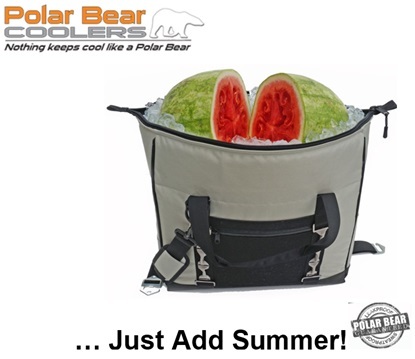 The Polar Bear Coolers® brand, model number PB 247 on Amazon.com® is the Original Performance soft cooler with upgrades in 2018. The upgrades are the TPU (thermoplastic polyurethane), a class of polyurethane plastics with many properties, including elasticity, transparency, and resistance to oil, grease, and abrasion. This cooler review is for the 24-pack and it is also available in a 48-pack and a backpack style, see #10 below. This gives the interior lining antimicrobial properties with its FDA approved TPU double-coated nylon safe storage for perishable food. Therefore, the double-coated nylon interior and the best of the best YKK® zippers and side release buckles make this is soft cooler the one to yearn for. The #10 rust-proof weatherized zippers repair themselves. The initials YKK® stand for Yoshida Kōgyō Kabushiki a Japanese zipper manufacturer making great types of zippers for 71 countries. The cooler’s outer shell is UV-resistant 840D (denier) TPE (thermoplastic elastomer) luggage grade nylon. The seams are all double hemmed with anchor stitching for durability. The side zipper pocket is handy for storing your keys, cell phone, and other small items you need in a hurry and don’t want to carry. The cooler also has a shoulder strap. One large mesh pocket that stretches for larger items, and two water bottle pockets are on either side. 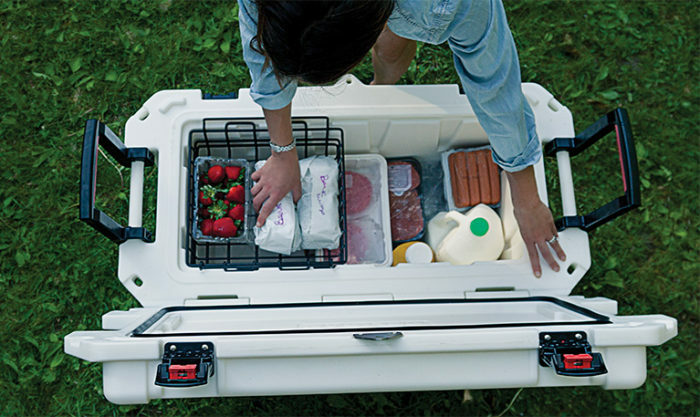 Holding 24 cans, 10-pounds of ice, or 18 bottles plus 10-pounds of ice, or a huge watermelon, this is the perfect cooler for your RV and camping adventures, picnics and more. It is designed and built for days of fun in the hot sun to 100-degrees F. and up to 24-hours with its 1-inch 10-gauge high-density foam insulation. The cooler does not leak or sweat and stays dry outside. If you don’t want to carry ice, it will keep cold drinks cold for hours. It will hold a bottle of wine when it lays on the diagonal. This cooler will keep hot foods hot—don’t add ice, and never use dry ice that will ruin it. The 24-pack will fit in the overhead bin on an airplane, but not under the seat if it’s full. There is no drain plug; unzip and drain the water out of the top and allow it to air-dry. Wipe it down inside and out with mild detergent and water. Rinse a few times, and hang up to dry. Do not put it in a clothes dryer or it will be destroyed. The exterior dimensions are 18-inches long x 10-inches wide x 12-inches tall. The Interior dimensions are 16-inches long x 8-inches wide x 10-inches tall. You will receive your Polar Bear Cooler® Soft Cooler, a User’s Manual, and a Lifetime Warranty against defects. The cooler is made in China. 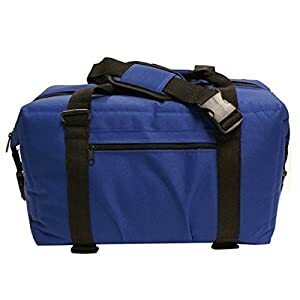 The MOJECTO™ best soft cooler bag is versatile to take with you anywhere with its heavy-duty polyester material and high-density super insulation. It has a double zippered closure, and numerous mesh pockets for extra items. 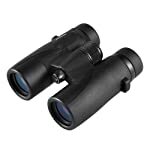 It comes with 2 heat-sealed removable PEVA liners. PEVA is a polyethylene vinyl acetate and is a plastic and a vinyl. In fact, there are several types of vinyl-ethylene vinyl acetate (EVA), so PEVA is polyethylene vinyl acetate, in case you didn’t know. The liner resists wrinkles and is leak-proof being very thick. The PEVA material is not toxic and is much stronger than other deniers (D) and is preferred in the making of cooler bags. The stitching is extra durable for not tearing apart or breaking out. The material is made of 840D heavy duty polyester fabric that means it is 840 x 1680 denier nylon stiff mesh used for commercial grade luggage and coolers. The PEVA liner is replaceable and easy to clean if it becomes soiled. It is BPA-free. 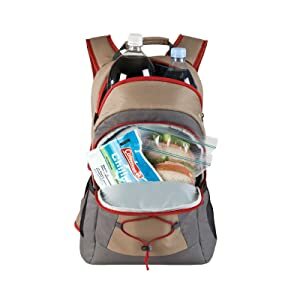 Take this adaptable many purpose cooler with you for your lunch, hiking, picnics, and other places you need cold drinks or warm potato salad. It will be easy to carry with its padded shoulder straps that are removable. There are also 2 long handles for carrying easily as well. The shoulder strap slides over the carrying handles for ease in clutching. 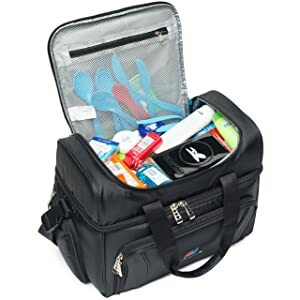 The dimensions are 15-inches long x 12-inches tall x 9-inches wide for this black cooler bag that weighs a slight 2 pounds. MOJECTO™ recommends you use icepacks or ice gel made specifically for cooler bags. Ice cubes, homemade icepacks, or ice blocks will damage the liner. The sharp edges of the ice can cut into the liner ruining it. You will receive an extra free bonus PEVA liner, instructions, and a Lifetime Warranty against manufacturing defects. 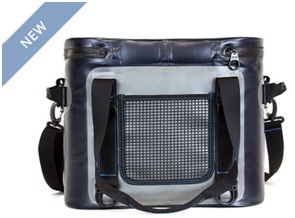 The eBags® Crew Cooler II is updated from the original Crew Cooler. It is soft all over and comes in a rainbow of fun color names of blue yonder, eggplant, green envy, gray matter, pitch black, sinful red, and tropical turquois. These bags were first created for pilots and flight attendants, but soon we all found them so cool that we wanted one! Now we can have them! The top compartment is for dry items and perishables with 2 zippers that pull. The material is made of 840D twisted heavy duty polyester fabric that means it is 840 x 1680 denier (D) nylon stiff mesh used for commercial grade luggage and coolers. 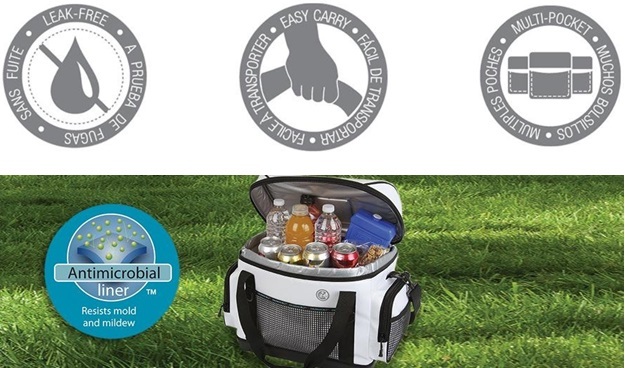 The cooler is great for travel, picnicking, and camping. It will sit on top of motorcycle handlebars and on wheelchairs. The satin nickel pull tabs on the zippers at the mesh pocket in the lid will be useful for small things such as napkins and tissue. The cold compartment in the bottom is well insulated on all 6 sides with a welded PVC-free PEVA liner. PEVA is a polyethylene vinyl acetate and is a plastic and a vinyl. In fact, there are several types of vinyl-ethylene vinyl acetate (EVA), so PEVA is polyethylene vinyl acetate in case you didn’t know. The liner can be removed for washing and is replaceable if it is ruined. The front pocket tips out with 2 zipper pullers and has pleated sides so that things will not fall out. The PVC-free food-safe PEVA lining complies with the lead standards mandated by the state of California. It is BPA-free. Another mesh pocket is elasticized for small packets of condiments with another mesh pocket in the front that is ideal for plastic ware or other items. The pouch pocket zips on each end and are useful for bottles. It will keep items cold for 6 to 8 hours. You will appreciate the 3 ways to carry the cooler: use the padded web handles that are reinforced with rivets with stitches of the box-x style; the removable shoulder strap that you can adjust; or the rear pass-through pocket to stack on top of your carry-on luggage that has wheels. A small identification pocket on the back lets you put in a standard business card, or a simple card you make for “return to phone number” without an address for confidentiality. The professionals suggest using heavy-duty thick zip lock baggies to hold your ice. It will keep the ice where you want it to be easy to refill from hotel lobbies. Do not over pack your cooler, since the lower compartment can fail its seams. You can also use 1 large and 1 medium size ice packs in the cooler. Dry ice is not recommended. It will hold 12 cans plus ice, plus food easily. It will fit nicely on planes under the seat in front of you with room to spare. It does not have wheels and sits flat on a surface never bending or flopping over. The exterior dimensions are 14-inches wide x 10.5-inches long x 10.5-inches high; the linear Inches are 34; and it weighs 2 pounds. The lower section cold compartment is 7.5-inches high x 13.5-inches wide x 7-inches deep. The inside top pocket is 3.5-inches deep x 14-inches wide x 7-inches long. The front pocket is 3-inches deep x 11-inches wide x 5-inches tall. The eBags® Crew Cooler II provides a Limited 5-year commercial use Warranty for pilots and flight attendants with a Limited Lifetime Warranty for non-crew regular people. You will receive instructions. The cooler is made in the USA. The AO Canvas Series are a best soft cooler not to be confused with inferior products being sold. AO has been making the canvas coolers for over 20 years. They will never sweat, condensate, or leak. The inside has a durable polyurethane vinyl liner that is used by the industry for waterbeds and pools that are above ground. The liner can be pulled out and turned inside out for easy cleaning. The stylish colors to select from are black, charcoal, mossy oak, navy blue, red, and royal blue. This review is for the 24-can unit but it comes in 12, 24, 36, 48, 15, and 38 packs to hold that number of cans. See capacity for the units. With the inner insulation being 3/4-inch thick, the closed cell high-density foam will chill food and drinks holding ice for 24 hours in 120-degree F. heat. Hope you’re not going to Death Valley—but the cooler can handle it! The outside is soft and will not scratch your vehicle or tear at the upholstery. The coolers are so well accepted that the high-end boat companies sell them. They have been used, tested, and sold by some of the leading boat manufacturers and outdoor sports dealers. The AO cooler is ideal for fishing trips, boating, hunting, sporting events, home barbeques, picnics, and a long ride on a day trip in the RV. Use it at the pool to keep cold drinks cold. The 2 side pockets zipper shut and are great for dry things such as a book or your camera. 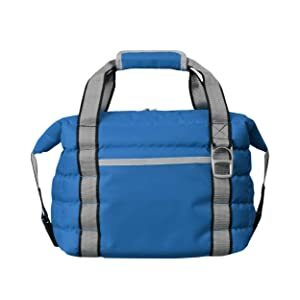 The top has a zipper that can be opened from either side or closed together in the middle, handles that close shut, and a wide padded shoulder strap that is detachable. Water will not get into the side pockets from the inside. They are not waterproof however, if you happen to accidently get water into them. The cooler capacity: 9 cans plus about 2.5 pounds of ice; 12 cans plus about 5 pounds of ice; 24 cans plus about 14 pounds of ice; 36 cans plus about 10 pounds of ice; and 48 cans plus about 15 pounds of ice. The 24-pack cooler measures 12-inches high x 10-inches wide x 17-inches long and weighs about 2 pounds. Gift-wrapping is available for your adventuresome friends and family and the AO cooler comes with a lifetime guarantee. The NorChill® soft-side cooler bag is available in black, blue, camo, or red colors to match your camping décor. It is made of canvas and will keep your beverages cold or hot food hot with its Dual Temp Insulation System™. The fold-down clips allow you more compact space with its squared edges. 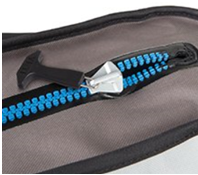 The zippered kangaroo pouch pocket uses the YKK® zipper that will not break and is heavy duty. It is a marine canvas zipper that will not corrode made of a nylon slider and teeth. The teeth are molded to a tape and then double stitched to the bag for added strength and functionality. No one wants a rusty zipper that no longer works when ready for traveling or camping. You can always put small cooler bags in your larger ice chest. The medium best soft cooler holds 24 cans, the small cooler holds 12 cans, and the large cooler holds 48 cans. The cooler will fit under an airplane seat in front of you, used as carry-on luggage, and to be used as a cooler later with ice packs. Use it for travel, fishing, boating, camping, sports events—anywhere you need a cooler and this one is accepted at most race track events. You can also use it for your workout tights, electronic items, or for lunches. The shoulder strap provides comfort to carry the cooler with you and is removable. It does not have additional handles. The medium cooler will hold a 5-pound bag of ice with 24 cans. The liner seams are fusion welded for superior strength. There are no toxins, and the materials are lead-free. Of course, the nylon shell with its puncture resistant G8TRSkin™ liner that is leak-proof, and puncture resistant is easy to clean made of a vinyl blend resisting stains. It has a Dual-Temp Insulation System™ with a condensation barrier to eliminate wetness and sweating on your vehicle carpet. The cushion has open cell foam around the entire bag with an insulating air barrier for sustaining ice for a day. The cooler will roll up for putting in luggage or putting away for storage using the shoulder strap to secure it. The dimensions are 10- x 18- x 12-inches and the cooler weighs 4 pounds. Gift-wrapping is available for loved ones or friends. You will receive instructions and a 2-Year Limited Warranty. The Bayfield Bags are lightweight thermal coolers with heavy duty lining and insulation to keep your items and drinks cold. The soft-sided cooler is medium and will hold 16 cans. The Flex Cooler LG is soft-sided and made from durable quilted polyester, with 0.75-inches of thick insulation, and thick double-heat sealed PEVA liner, a polyethylene vinyl acetate and is a plastic and a vinyl. In fact, there are several types of vinyl-ethylene vinyl acetate (EVA), so PEVA is polyethylene vinyl acetate. It is BPA-free. 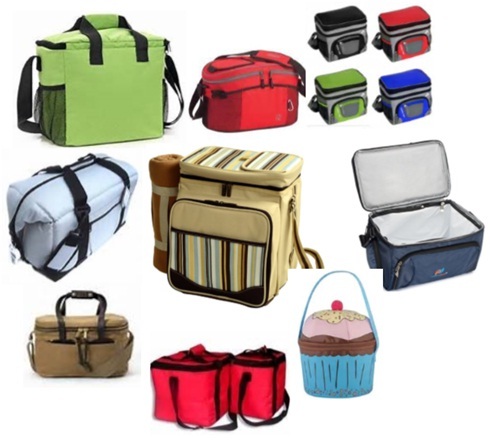 It is lightweight and portable for all your occasions and it will collapse for packing. It comes in red, blue, or camo. The camo color is very feminine for the ladies to take their workout clothes with them. It is a lovely color and pattern for taking lunches to the office or an outing. Teenage young ladies will love this when with their friends. The construction is heavy duty with webbing straps and buckles that will not tear. The buckles compress to easily fold the top edge down and snap into place. This function keeps beverages and food colder for longer times preventing contents from shifting. Added features are a steel bottle opener and key clip for easy opening bottles and a place to safeguard your keys. The handles use Velcro® to pull them together for easy carrying. Remove your cans, fresh fruit, and food out from the wide top opening, then close it with the zipper, strapping it down to keep things cold. A shoulder strap is not included and there are no side pockets except for a thin one wide enough for a checkbook. The dimensions are approximately 13-inches high x 14-inches long x 7-inches wide when expanded and weighs about a pound. You will receive an instruction booklet. No Warranty information is available. 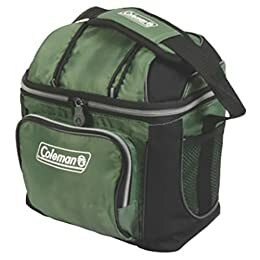 The Coleman® people have been making the very best camping equipment, hard coolers and ice chests for decades having a great reputation. The model number 3000001311 on Amazon.com® is a best-selling soft cooler in the marketplace. Take it along with you to picnics, BBQs, put it in your camping tent, take to sporting events, tailgates, fishing trips, and beyond with 100% confidence. It comes in red or green. What’s nice about this soft cooler is that it has a hard liner inside that is removable for more storage flexibility. It will hold 30 cans and you can use ice or ice substitutes for keeping everything cold. Never use dry ice because it ruins the cooler forever. It will also hold several 750mL wine bottles and about 8 each 12-ounce bottles. With the adjustable shoulder strap, you can carry over your shoulder or use the handle for your hand. It has a front zipped pocket with inside top mesh pouches for small item storage. With the 2 side bungees you will have quick access to any items. It can go on airplanes to be put in the top overhead bin. It’s best to remove the hard liner for this. The FDA approved liner made of PEVA (polyethylene vinyl acetate) is a plastic and a vinyl for permanency and ease in cleaning with tremendous flexibility and is soft. The material has antimicrobial benefits to resist mold, odors, and mildew when being wet inside. The heat-welded seams keep the liner inside from leaking. The outside dimensions are 12.2-inches long x 9.65-inches bottom x 13.78-inches tall. The inside dimensions are 10.75-inches long x 8-inches bottom x 10-inches tall. It weighs 2.2-pounds empty. It comes with a User’s Manual with instructions for care. Coleman® products have a Limited Warranty from the date of original retail purchase that the product will be free from defects in material and workmanship. The Warranty is valid for the original retail purchaser from the date of initial retail purchase and is not transferable. 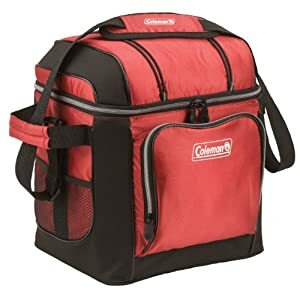 The Coleman® people have provided campers and hikers with this unique backpack cooler. The model 2000013747 is ideal for daytrips or hiking/camping with more people to share with different carrying bags. See it on Amazon.com® for its affordable price in the best backpack cooler design. 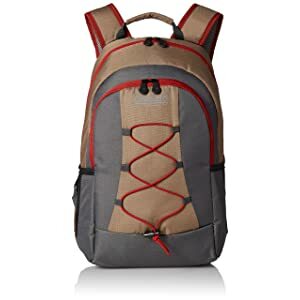 They make great backpacks for travel and hiking too. The colors are gorgeous for both men and women in kaki and orange. The crisscross straps remind me of the Native Americans’ papoose for carrying babies. It will hold 28 cans and you can use ice or ice substitutes for keeping everything cold to 95+-degrees F. Never use dry ice because it ruins the cooler forever. 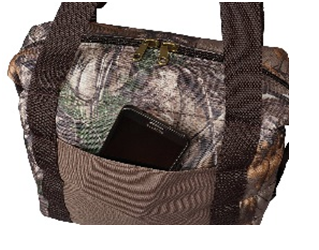 It has a large zippered front heat-welded pocket for dry items and small gear such as a cell phone or iPad. You won’t be tired carrying the backpack with its padded back, waist strap, and other straps that are supportive and comfortable. It can accommodate a few wine bottles as well. It looks as though you can carry it on your chest or your back. The waist strap is about 70-inches around for larger waists. It has no chest strap. It is BPA- and phthalate-free. The bungee cord on the front also provides quick access to other items. It’s antimicrobial, product-protecting properties are built into the flexible lining to resist odor, mold, and mildew, making it easy to clean between uses. The pack will not leak if you don’t turn it upside down to leak from the zipper. The front part of the back pack is not a cooler, just the back part. See picture to the right. It will hold a 16.5- x 11-inch laptop in the large section. The dimensions are 19.38-inches long x 14.76-inches wide x about 6-inches deep. 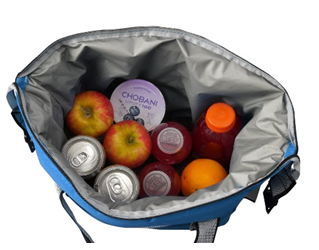 For family outings and camping, have a cooler for drinks and a separate best cooler bag for warm items so there is no cross contamination. You don’t want all your food smelling like deviled eggs or onions, so put them in a tight fitting plastic container in its own warm cooler. Since you open your cooler holding the drinks more often, have a separate cooler for cold beverages and another one for warm foods. Keep beverages in its own cold cooler with ice on top. Precool everything before packing. Since cold travels downward, put the ice on top. Keep the cooler out of the sun and heat. For keeping a separate cold cooler cold, purchase arctic cold packs or block ice putting in a zip-lock bag. Your warm foods can be wrapped tightly in aluminum foil and put in its own best small cooler, or in an ice chest cooler. Put the food on the bottom with hot packs covering the items with towels. You will not be letting warm air in on your warm foods to spoil it to grow bacteria making you sick from food poisoning. We’ve given you ideas for different types of soft coolers for your journeys or staying near home. Check out customer reviews, check Warranties and check for customer service for problems you might encounter. Soft coolers are lightweight and easy to carry. 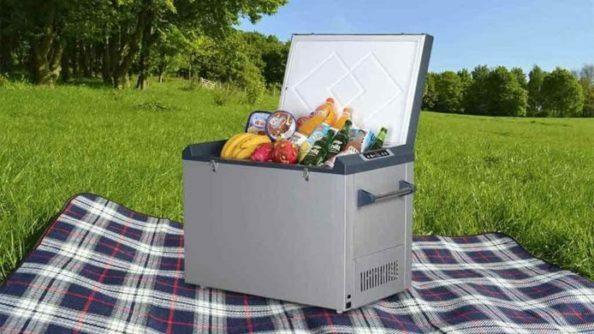 With the hundreds of coolers available, the best ones have been selected here for you to consider. Have a happy summer with cold or hot food and drinks! Leave a comment or question at the bottom of this page and we will answer every time.